AN APP STORE "BEST NEW APP" — Also featured in the "STAY ON TASK" and "GET STUFF DONE" categories in Productivity. THROW AWAY YOUR CALENDAR AND TO-DO LISTS FOR THE ULTIMATE LIFE PLANNER. Your to-do lists aren’t smart, your calendar isn’t focused, and your life moves far too fast. 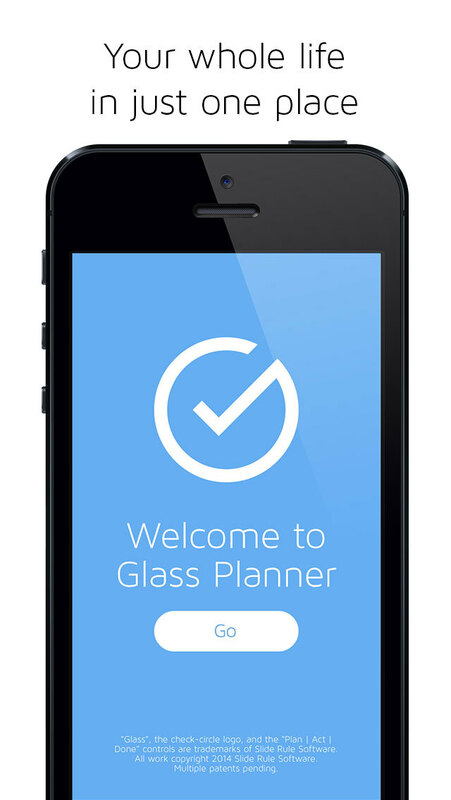 Glass Planner combines a powerful personal and professional calendar with to-do list and task-management functionality in an intelligent yet easy-to-use prioritization system that keeps you focused on what’s important. It’s a new way to organize your life and your work. 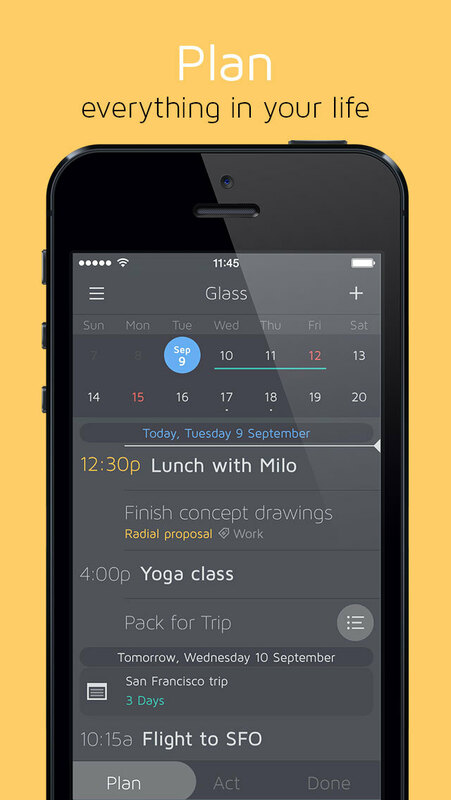 In Glass, you manage your tasks right in your calendar, where you can schedule them into your day. And when it’s time to get things done, Glass shines. 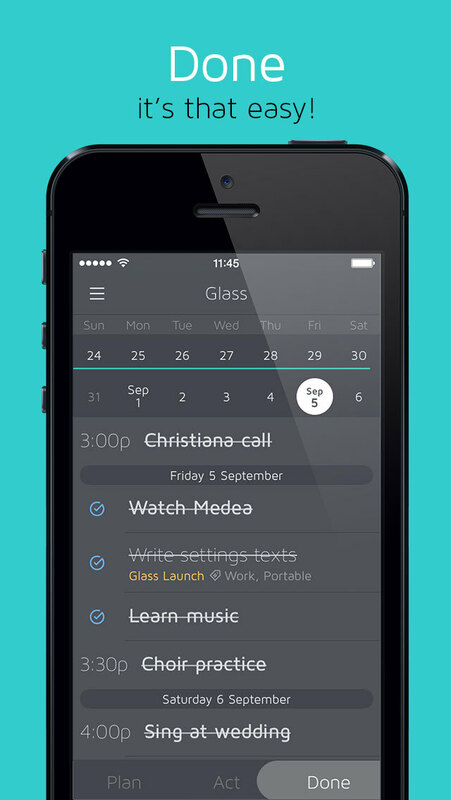 Just touch the Act switch, and Glass transforms your calendar into a streamlined action list. You see only today’s appointments, and only those upcoming tasks you can act on now, all sorted by priority. All other distractions are eliminated. This isn’t a simple list and calendaring app—it’s an automatic, intelligent life planner that lets you think months ahead or sharpen your focus to the next few hours. Glass syncs with your iCloud Calendar so you can work with your schedule on any Apple device. Glass is compatible with David Allen’s “Getting Things Done”—and then some—with additional prioritization and filtering that non-calendar-based GTD apps can’t provide. Explore Glass’ depths and you’ll find a complete set of tools that make big planning possible—even fun—on a small screen. + iTunes doesn’t make it possible for us to respond to App Store reviews, and we hate seeing problems in a review that we can’t help someone with. So please write us directly on [email protected] if you find an issue with Glass. We love interacting with our users and are here to help! + A turbocharged iPad upgrade that fully syncs with your iPhone should be available in May. + Intuitive calendar navigation makes Glass feel big even on small screens. + Calendar syncing keeps Glass in sync with your Apple Calendar events. + Glass’s ACT view shows you what you can act on NOW, all sorted by priority—perfect for just getting things done. + Highly customizable repeats keep your calendar uncluttered. + Checklists can be attached to any action item in Glass—great for shopping lists, meeting agendas, parts of assignments, and more. + Use Tags to group items according to location or context, so you can act on them with maximum efficiency. + Timelines let you hide tasks that are not yet actionable. + Projects in Glass are uniquely dynamic and informal—you won’t hesitate to create projects with just a few subtasks. + Fans of David Allen’s “Getting Things Done” are calling Glass a significant advancement from traditional GTD planners. + Original graphics by Mucca Design in New York City. + Original sound design by Moonshot Music of London, U.K.
Visit our website to learn more—and thanks for giving Glass a try!